I’ve written here before that my husband is in the military. Well, he is deploying in early June for a year and I’ll be home with our three boys. He left this morning for a 3 week training. I’m hoping to update this blog more as he’s deployed. I can’t find many blogs that talk about National Guard deployments and that’s what we’re going through, so if I’m able to help one person with how we got through a deployment, then it’ll be worth it. Last night before the big boys went to bed (they’re 4 and 2), my husband and I sat them down and told them that Daddy will be going to Army for a couple weeks. They’ve begun to understand what it means when he “goes to Army” because he’s had quite a few trainings lately, preparing for deployment and everything. They gave him hugs and kisses and he told them to be good, help me, and he’ll talk to them as much as he can. Adam had a bit of a rough night. He woke up around 11 pm and didn’t go back to sleep until 1 am, but when he woke up this morning he was in a great mood. Andrew was in a great mood also, he did so much of our morning routine by himself. Our morning routine is fairly basic. We wake up and get dressed, come to the living room and read books or play with toy cars for about 20 minutes, then take vitamins and head out the door. Their school serves breakfast and brushes their teeth afterward. A lot of people are SHOCKED when I tell them my 4 year old has been in school for almost 3 years now. Here in Northern Panhandle, West Virginia we have early head start and head start. At our school specifically, the kids start at age 1. At other schools, they can start as early as 3 months. There are also home visitors that come visit every so often (depending on the child’s age) and observe the children to make sure they’re where they should be developmentally. It’s a really great program honestly. My 2 year old has been in school for almost a year. Him starting school actually has a funny story. On a Monday, I got a call about an opening in the 3 year old class for my (at the time) 3 year old. I took the spot so he moved up the next day. The Friday of that week, I received another call that there was an opening in the 1 year old class and my (at the time) 1 year old was next on the waiting list. I told them I would talk to my husband and call back. Adam was my baby at the time, however I was 6 months pregnant at the time. After I talked to my husband, we decided it would be best to put Adam in school so he would hopefully adjust before our third baby came along. 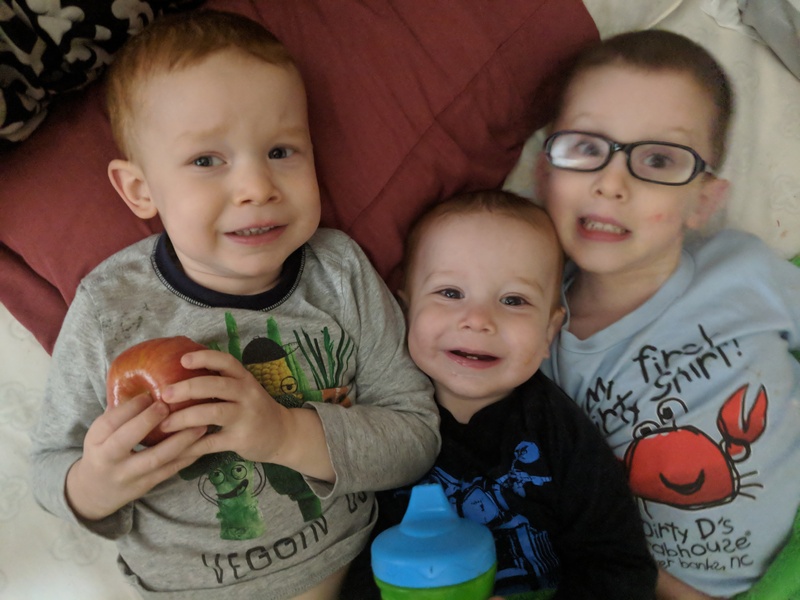 Back to now, Andrew is signed up for Pre-K next year, Adam will be moving to the 2 year old room in July, and Jack’s application is in and ready for him to turn 1 in August. I’m hoping that the big boys had great days when I go to pick them up soon.